The 58,600 sf final building in the Farmers Park mixed-use development. In keeping with Farmers Park’s commitment to serve as a prototype for sustainability in the region, the new building is designed to achieve LEED Silver Certification. 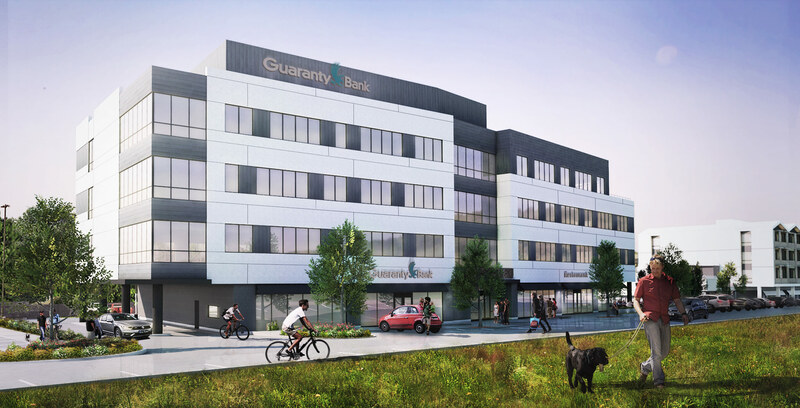 The building’s program is a mix of 2,000 sf of ground level retail and 42,350 sf of multi-story office space, with Guarantee Bank already committed to occupying 24,200 sf. A new tiered circular park space on the west side of the building will join the new building with the development’s existing weekly program of activities to promote a pedestrian lifestyle and community interactions.